A charter bus driver is accused of driving while intoxicated while shuttling a high school swim team last week in San Francisco. The George Washington High School swim team had just finished strong at a high school swim meet in the Bay Point district. They were riding the charter bus back to their campus in the Outer Richmond, and that’s when the swim coach noticed something wasn’t right. In cellphone video shot by coach Danny Camacho last Friday, he is heard telling charter bus driver, Aaron Friedman, the bus ahead can't move because it’s at a red light. Camacho says he started shooting video because he noticed the driver acting weird. 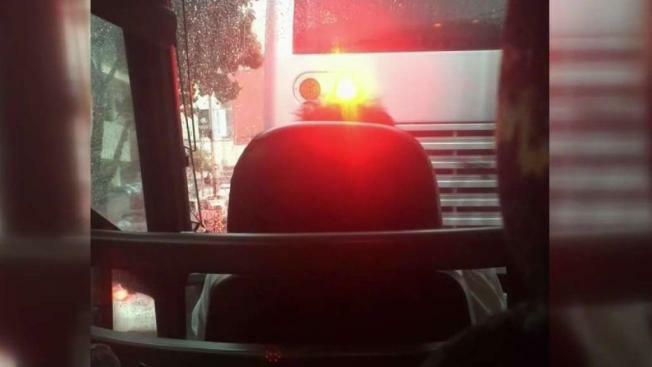 "He ran a red light on Market Street, and then he started following an AC Transit bus too close," the coach said. Camacho also heard the driver cursing and then starting to slur his speech. "I’m a professional driver," Friedman told Camacho in the video. That’s when Camacho decided to go to the back of the bus and call for help. "Just when I was talking to 911, he decides to make a U-turn on Sixth and Geary," Camacho said. "And as he was making the U-turn with his big bus, he made a wide turn and hit a telephone pole." The large white bus is owned by Charter Bros.
Friedman then suddenly stopped and went to the restroom in the back of the bus. Camacho then decided to get his team members off the bus. Friedman pleaded not guilty in court Thursday, but according to the district attorney’s office, he has to wear an alcohol monitor; he’s not allowed to drive; and he has a protective order against him on behalf of the teenagers on the bus. Camacho said most of his students didn’t realize what was happening until the bus hit the pole. "Everybody’s fine. Luckily nobody got hurt," he said. Friedman could not be reached for comment late Thursday.